Below you will find all of the information that you need to plan your game day at our match at Etihad Stadium on Sunday. Come along and watch the Lions' Captain's Run on Saturday before the match. Round 11 is the official Sir Doug Nicholls Indigenous Round - named after the former Fitzroy player who went on to become one of the country's most pivotal Indigenous figures and epitomised the spirit of reconciliation. The Brisbane Lions will be active in celebrating and recognising Sir Doug Nicholls Round - both surrounding the Round 11 clash with North Melbourne, and the following week's home game against Essendon at the Gabba. The Brisbane Lions' official Club Hub (located outside Gate 5 at Etihad Stadium) will be dedicated to the Fitzroy-Brisbane Lions Historical Society, who will be on hand to help educate fans in all aspects of the Club's rich history. A range of memorabilia and artefacts will be on display for fans to browse, along with video highlights from some of Fitzroy's glory days. Fans can sign-up as a Historical Society member for just $20, grab a commemorative 'Fitzroy' book for just $20, and even book in for their upcoming Museum Dinner which is themed around the 'Roaring 80s'. 2018 Brisbane Lions membership caps and scarves will also be available for collection for members with their official voucher. NB: As there will be no membership or merchandise sales prior to the North Melbourne, we recommend fans contact the Club directly during the week to either sign-up as a member or pre-order their merchandise. Brisbane Lions VIC-based members and supporters with general admission entry can sit together in the 'Lions Only' area located on Level 3 at Etihad Stadium between Aisles 41-42 on Level 3. Members wishing to upgrade their GA membership and purchase a Level 1 seat can do so directly through Ticketmaster. A Lions-Only area has been reserved on Level 1 next to the cheer squad at the Bourke Street end of the stadium. 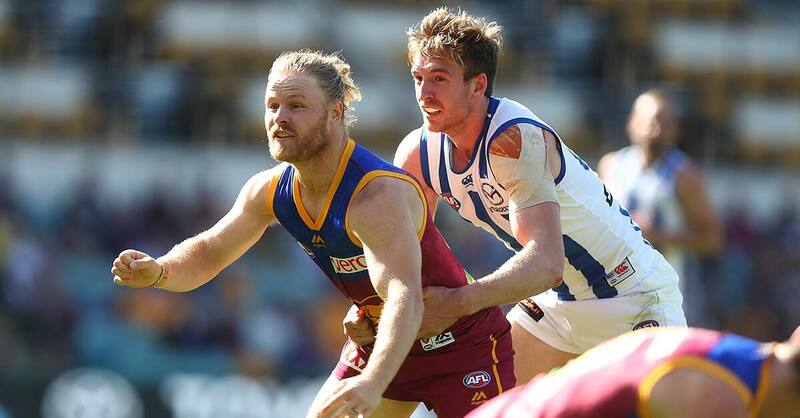 Victorian members of the Brisbane Lions can upgrade their general admission membership to a reserved seat for just $11 at this Sunday’s clash against North Melbourne. Click here to upgrade now through Ticketmaster. Want to do something more special at our match days in Melbourne? Then why not join our fast-growing Lionhearts supporters group, which is made-up of like-minded Lions fans who like to enjoy all-inclusive (yet casual) functions together before games. All Lions members and supporters are encouraged to stick around after the game to meet some of the players at the Club's official aftermatch function. The function will commence immediately after the final siren (approx. 3:45pm) in Etihad Stadium's Victory Room, which is located inside the ground on Level 1 between Aisles 14-16. The event will feature interviews with special guests including a handful of players who will make their way up to the room following their post-match warm-downs. The bar will also be open inside the room should any fans want to grab a snack or a drink post-game. Entry is FREE with the function expected to run until approximately 5:30pm. Thanks to the Brisbane Lions Coaches Partner, The Coffee Club, all game access Victorian Members will receive a FREE small hot beverage from any one of the participating stores across Melbourne on Monday, 4th of June. Simply present your Victorian Membership Card to redeem. More information.